Live TV, right next to your apps. Channels lets you play, pause, and rewind local or cable TV directly on your Apple TV using your HDHomeRun device. Now you really can have one device to rule them all! Channels requires an HDHomeRun networked TV tuner to watch live TV on your Apple TV. Learn more about how this works below. "I can tell you it’s buttery smooth" — Zatz Not Funny! Channels is the missing piece of your puzzle. If you already watch everything through streaming apps, Channels lets you finally watch sports, award shows, local news, and other live events. • Netflix, Hulu, Movies, Games, AirPlay, and now live TV without switching inputs – the holy grail! • Using antenna for live TV? Channels lets you use one antenna for all the TVs in the house. • Want sports on your porch? News in the kitchen? Channels adds live TV to any TV in your house. • Save money by ditching cable boxes and watch your cable subscription with Channels on your Apple TV instead. An HDHomeRun is a simple TV tuner that can broadcast television over your home network to any room in your house. 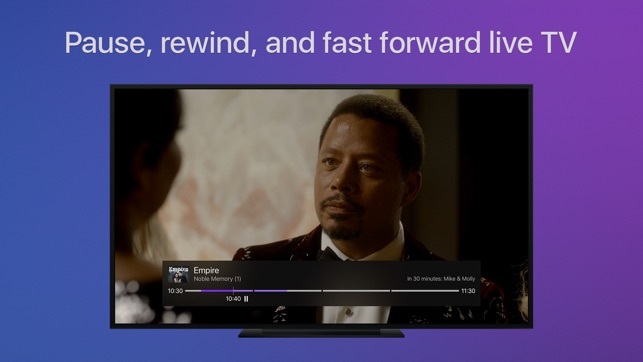 Channels uses it to let you watch live TV on your Apple TV. 3. Watch live TV via the Channels Apple TV app. • Pick your favorite channels by clicking on them in the Settings tab. • Switch to the Favorites tab and browse what’s on. • Click on a channel to start playing it. • Skip ahead 30s by clicking the right side of the Touch surface. Skip back 7s by doing the inverse. • Double-click the Play/Pause button to switch back to the previous channel. • Tap to reveal the timeline, then scrub through the buffer with the Touch surface. 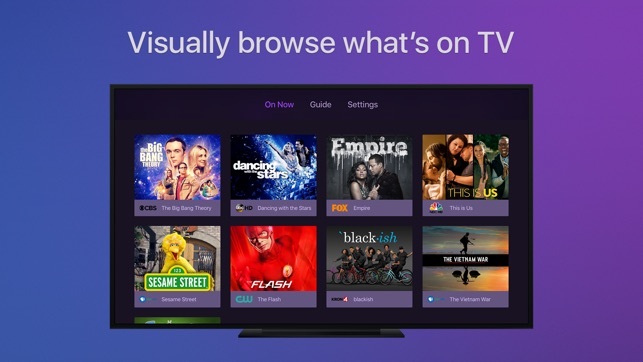 • Swipe down to bring the Quick Guide to see what else is on your favorite channels. • Change tabs while in the Quick Guide to toggle closed captioning or adjust audio languages. Note that DRM protected streams are *not* currently supported. - IMPROVED: [DVR] Double-click to skip commercial will seek to the end of the commercial more accurately. - FIXED: Some channels in Finland would not play correctly. - FIXED: Some channels in Finland and Italy would play english audio instead of native language. - FIXED: [DVR] Search would not work when using quotes. I recently purchased Channels for my AppleTV 4K, which I use with my HomePod for audio. Unfortunately I discovered after purchasing the Channels app for appletv that the app doesn’t yet support the new Airplay 2 protocol, which results in an audio delay mismatched with the picture. All other apps on appletv that support AirPlay 2 work fine with audio on HomePod. Otherwise the app works great. Can you please let me know when or if you plan on adding airplay 2 support for your TV app? Will change to 5 stars once this happens...Thanks! It’s a great app. The interface is very user friendly and useful. Much better than the Plex TV DVR app. However, it doesn’t play well with HomePod. Sound syncing is hit or miss. Sometimes it’s spot on and sometimes it’s way off and I have to restart the app to get it in sync again. I don’t have this syncing problem with any other app, just this one. Super annoying. Also, there’s no way to change the sound output from inside the app. All other apps let me change the output on the fly with the drop down menu in the app. With Channels I have to completely exit the app if I want to change from HomePod to my surround system. It’s a shame because otherwise I really, really like this app.